After skiing on Shasta and Shastina over the weekend with Jeff Huber, I headed south on Monday morning towards Lassen Park, catching some excellent views of the SE side of Mount Shasta on the way. It was a beautiful sunny day, and I was hoping to ski 8677 ft Crater Peak in the Thousand Lakes Wilderness, the highest point on the rim of an old eroded stratovolcano about 15 miles NNW of Lassen Peak. The Thousand Lakes stratovolcano is the 21st highest Cascade volcano, but the highest to miss the cut for inclusion in my upcoming guidebook. I had hiked to the summit in September 2003, but never managed to ski it yet. Anyway, the big question was if there was enough snow to do so. The snowpack at 8000 ft on Shasta and Lassen was still 6-8 ft deep, but I knew it would be a lot less in the Thousand Lakes Wilderness. Driving down SR 89 towards Lassen, I took a short side trip east on SR 44 to try to get a view of Crater Peak. The Hat Creek Rim Viewpoint on SR 44 offers a spectacular panorama of numerous volcanoes large and small from Lassen north to Shasta, but unfortunately Crater Peak and the Thousand Lakes stratovolcano is hidden behind the much shorter Sugarloaf Peak in the foreground. I drove north on the red gravel of FR 34N34, hoping to get a clear view shortly. Within 3 miles, the trees thinned and the view opened up into an even more impressive panorama than that at the official viewpoint (see a 5-image panorama at 2 resolutions: 2200 or 4400 pixels wide), including a perfect view of the Thousand Lakes stratovolcano--and disappointment!. Although 8550 ft Magee Peak (the 2nd highest point) had enough snow to ski a short run in the huge NE cirque, the primarily SE-facing slopes from Crater Peak into the cirque were nearly bare. Only a short ribbon of snow extended down the NE Ridge of Crater Peak before petering out near 8000 ft. It was definitely a couple of weeks too late for this volcano to offer worthwhile skiing. What to do? I drove on to Lassen Park, unsure how to fill the rest of the day. It was getting too late and too warm to ski anything safely on Lassen Peak (or so I thought), so I decided to just hike the Manzanita Creek trail. 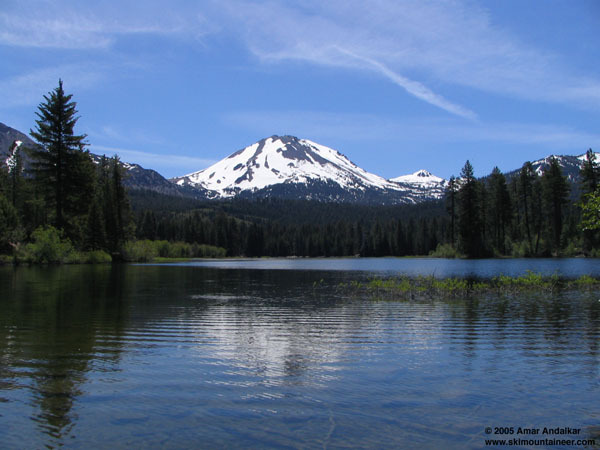 This trail follows the path of an old one-lane road built in 1925 from Manzanita Lake (5850 ft) towards Lassen Peak, ending in 3.5 miles at a 7000 ft meadow on the west side of the peak from which the original steep summit trail climbed to the summit. Completion of the main Lassen Park Road and current south-side summit trail in the 1930s threw the old route and road into disuse. The Manzanita Creek trail is reputed to be viewless and boring (which is why I'd never hiked it before), so I didn't expect much and figured I'd be back to the car in well under 2 hours. Most of all, the Manzanita Lake area is well-known to be in a strong rain shadow, receiving only a fraction of the snowfall of the south side of the peak. The snowpack at the lakeside ranger station had melted out in mid-April, so I figured there would be almost no snow on the trail and certainly nothing worth skiing. At 1:30 PM I hiked up the trail from the end of the campground, bringing only a fanny pack and barely half a liter of water. The 80-year-old road/trail remains in excellent condition, well contoured and smooth, making for a very quick and pleasant hike through open forest. But by 2.5 miles near 6700 ft, there was a real surprise: snow, lots of it! It quickly became 2-3 ft deep and continuous by 6800 ft at the edge of the meadows, and it was so well consolidated that hiking across it was effortless, no post-holing even in mid-afternoon. Views from the meadows included glimpses of the West Face of Lassen Peak and the dark 1915 lava flow at the summit, while the impressive cliffs of Loomis Peak towered overhead on the other side. I continued up the drainage and followed an obvious steepening gully heading west past Crescent Cliff, and soon I was rapidly ascending the west flank of Lassen Peak. 7000, 7500, 8000 ft, and finally I had reached treeline near 8200 ft, with an expansive view of numerous peaks throughout the western part of the park and all the way north to Shasta (see a 6-image panorama at 2 resolutions: 2500 or 5000 pixels wide). From the bottom of the face, it was quite obvious that continuous skiable snow extended all the way up the West Gully to the summit plateau. It was after 3:30 PM, I was out of water, and 3 pairs of AT skis sat uselessly in my car nearly 5 miles away. Somehow, this seldom-travelled route still offered over 3700 vertical ft of continuous skiing, the most of any route on Lassen right now, with well-consolidated corn snow that hadn't turned to mush even by late afternoon. And I was going to miss all of it. !@#$%^&*. "What do you mean you didn't bring skis?" There was no point in hiking up the last 2000+ ft to the summit just to intensify my disappointment, so I took a lengthy break, finishing the few meager scraps of food I had brought and slowly consuming nearly a liter worth of fairly clean snow to rehydrate. The hike back down the snow was quick, plunge-stepping in such fine conditions was actually quite fun, and I was back to the Manzanita Lake campground in no time. Anyway, despite my lack of skiing I thought I should write a trip report about this route, because it was such a surprise to find continuous snow down so low into the protected valley at the foot of Crescent Cliff. The Manzanita Creek route is best known as a winter cross-country ski route to the 7000 ft meadows, but it clearly offers an excellent downhill ski run from the summit of Lassen Peak, with 4600 vertical ft in winter and early spring, and nearly 3700 ft remaining even into June, accessible by an easy hike on a smooth trail. View of the northwest side of Lassen Peak from Manzanita Lake. The dark 1915 lava flow is visible just below and right of the summit, with the snowy West Face extending below the right skyline. Eagle Peak is the conical satellite at right. Click here for an enlarged version of this photo.